JBoss RESTful Web Services is a framework developed as a part of the JBoss Application Server. It implements the JAX-RS specifications. JAX-RS (Java API for RESTful Web Services) is a Java API that supports the creation of Representational State Transfer (REST) web services, using annotations. JBoss RESTful Web Services integrates with most current JBoss Application Server releases as well as earlier ones, that did implement the J2EE 1.4 specifications. Also JBossWS Tool gives a way to test a web service running on a server. JBossWS implements the JAX-RS specification. JBossWS supports EJB 2.1, EJB3 and JSE as Web Service Endpoints. JBoss Application Server 5 (JavaEE 5 compliant) web service stack. Create a Sample RESTful Web Service for a JAX-RS web service. These wizards are used within a Dynamic Web project. A dynamic web project can be created by following the steps in Creating a dynamic web project. The New Project screen displays. Click the Dynamic Web Project label by expanding the Web folder. The New Dynamic Web Project screen displays. Project name yes Enter the project name. The project name can be any name defined by the user. Project location yes Click the Use default location checkbox to define the project location as the Eclipse workspace or define a custom path in the Location field. The default location corresponds to the Eclipse workspace. This option adds support for the Java Servlet API with module versions corresponding to J2EE levels as listed in Table 2.2, “New Dynamic Project - Dynamic web module version”. The project can be based on either a custom or a set of pre-defined configurations as described in Table 2.3, “New Dynamic Project - Configuration”. <custom> Choosing from one of the pre-defined configurations will minimise the effort required to set up the project. BIRT Charting Web Project A project with the BIRT Charting Runtime Component. BIRT Charting Web Project A project with the BIRT Reporting Runtime Component. CXF Web Services Project v2.5 Configures a project with CXF using Web Module v2.5 and Java v5.0. Default Configuration for JBoss 5.0 Runtime This option is a suitable starting point. Additional facets can be installed later to add new functionality. Dynamic Web Project with Seam 1.2 Configures a project to use Seam v1.2. Dynamic Web Project with Seam 2.0 Configures a project to use Seam v2.0. Dynamic Web Project with Seam 2.1 Configures a project to use Seam v2.1. Dynamic Web Project with Seam 2.2 Configures a project to use Seam v2.2. JBoss WS Web Service Project v3.0 Configures a project with JBossWS using Web Module v2.5 and Java v5.0. JavaServer Faces v1.2 Project Configures a project to use JSF v1.2. Minimal Configuration The minimum required facets are installed. Additional facets can be chosen later to add functionality to the project. The New Dynamic Web Project - Java dialog displays. Define the Dynamic Web Project source and output folders by adding or editing folders as required. The New Dynamic Web Project - Web Module dialog displays. Define the settings as listed in Table 2.4, “New Dynamic Web Project - Web Module” including the root folder for path names in the web project context and the name of the web content directory. Context root yes Enter the context root for the project. The context root identifies a web application to the server and which URLs to delegate to the application. Content directory yes Enter the directory name for the web content. Web resources such as html, jsp files and graphic files will be written to the specified content directory. 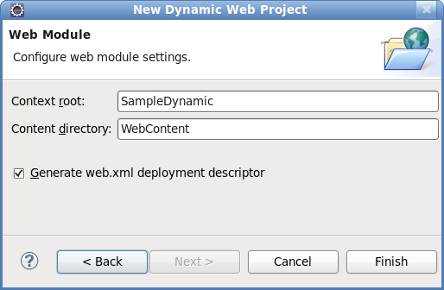 Generate web.xml deployment descriptor no Check this box to generate a deployment descriptor for the project. URL to servlet mappings and servlet authentication details are written to the deployment descriptor enabling the web server to serve requests. Open the Java EE perspective. Click the Finish button to complete the project setup. If not already set, a dialog will appear prompting the user to open the relevant perspective. Click the Yes button to display the Java EE perspective. The project is configured and the Java EE perspective is displayed. A sample RESTful web service can be generated by following the steps outlined in Generate a sample RESTful web service. 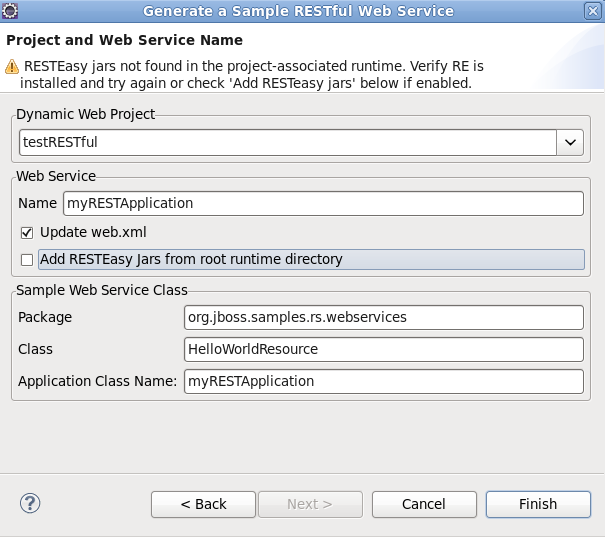 The sample RESTful web service will not work unless it is deployed to a server with RESTEasy installed, such as JBoss SOA-P. Right click on the project name in the Project Explorer view. Click the Create a Sample RESTful Web Service label by expanding the Web Services folder. The New - Select a wizard dialog displays with the selected wizard type highlighted. The Generate a Sample RESTful Web Service - Project and Web Service Name dialog displays. Due to the nature in which JBoss Application Server 7 and JBoss Enterprise Application Server 5 handle JAX-RS support, the wizard can now be completed without the need for RESTEasy JARs in the project classpath or associated project runtime. The JARs are necessary for JBoss SOA-P servers. Dynamic Web Project yes Enter the project name. The project name will default to the highlighted project in the Project Explorer. A different project can be selected from the list or entered directly in the editable drop-down list. Web Service Name yes Enter the name for the web service. The web service name will be the url for the service as mapped in the deployment descriptor (web.xml). Update web.xml no Check this box to add the service to the deployment descriptor. This option is checked by default and may be unchecked when deploying to JBoss AS 6.0 or RESTEasy 2.0 servers. Service information is not required in the deployment descriptor for these servers. Add RESTEasy Jars from root runtime directory no Check this box to add RESTEasy JARs to the project. This option allows you to add RESTEasy JARs to the project if they appear in the root runtime directory but are not installed in the runtime. While this is not required, it will assist when working with JBoss Application Server 5 and JBoss Enterprse Application Platform 5 web service projects. Sample Web Service Class Package yes Enter the package for the web service class. The default package for the sample web service will be displayed. Class yes Enter the name of the web service class containing the JAX-RS annotated path. This class defines the path to the web service and is referenced in the Application Class Name. The Application Class Name is declared in the deployment descriptor providing indirect access to the annotated path. Application Class Name yes Enter the name of the Application Class Name. The Application Class Name constructor instantiates objects of the web service class containing the JAX-RS annotated path, GET and POST methods. It serves as a single point of access to the application for the web server. Click the Finish button to complete the web service setup. The web service classes will be generated and the web.xml file updated with the deployment details. 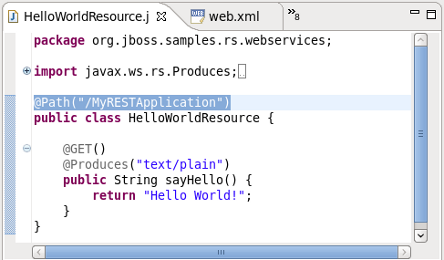 Double click the MyRESTApplication.java class and note the constructor instantiating objects of type HelloWorldResource. The relevance of this will be discussed shortly. 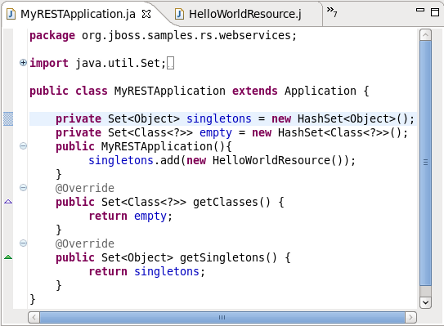 Double click the HelloWorldResource.java class and note the JAX-RS annotated path and the annotated GET method. the main servlet is not mapped to a particular url as indicated by /*. Identify the Application Class as defined in the deployment descriptor. Note the object type instantiated in the Application class and added to the singleton set: HelloWorldResource. 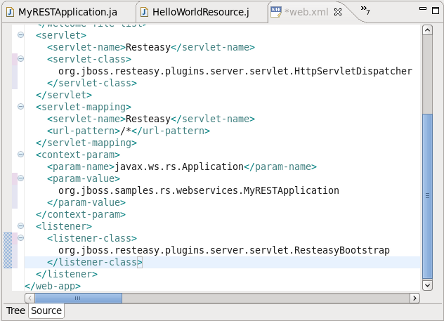 Note the JAX-RS annotated path declared in the corresponding HelloWorldResource class: @Path("/MyRESTApplication") . The url for sending GET requests is therefore http://localhost:8080/ProjectName/ or, http://localhost:8080/RestfulSample/MyRESTApplication. 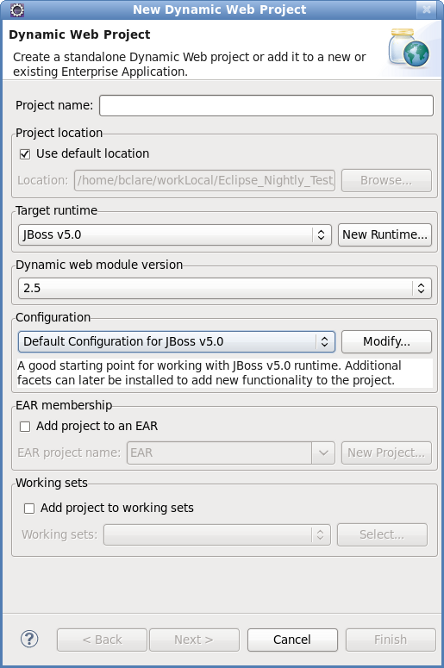 JBoss Tools includes many example projects which are available by selecting Help → Project Examples. The following sections describe setting up the example RESTEasy project. This project serves as a good example for testing the numerous Web Service Test View functions. The New Example Project dialog displays. Click the RESTEasy Simple Example label by expanding the RESTEasy node. Click the Finish button to complete the project set up. The simple project is configured and ready to build. In the event that a message is displayed indicating some requirements could not be configured, click the Details button followed by the Fix button to rectify the problem. The message will be displayed as a result of missing plugins or a requirement to select or configure a suitable runtime. The simple.war file is written to the project's 'target directory. Copy the simple.war file to the deploy directory of the required server profile such as the all profile. The simple.war file is written to the target directory. the main servlet is mapped to the url /rest-services/* . Note the object type (CustomerResource) instantiated in the Application class (ShoppingApplication) and added to the singleton set (singletons.add(new CustomerResource())). Note the JAX-RS annotated path declared in the corresponding CustomerResource class: @Path("/customers") . The url for sending GET requests can be formed from http://localhost:8080/ProjectName// or, http://localhost:8080/simple/rest-services/customers.. Select Export → WAR file. 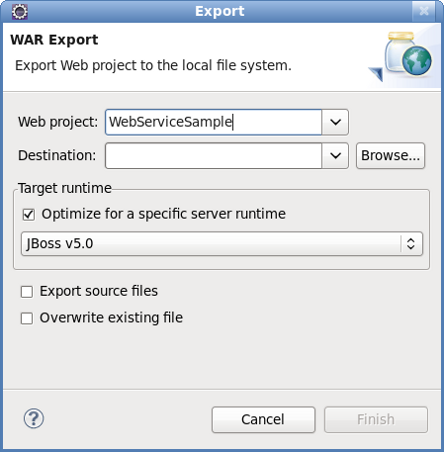 The Export- WAR Export dialog displays with the selected web project highlighted. Web project yes Enter the web project name. The project name will default to the highlighted project in the Project Explorer. A different project can be selected from the list or entered directly in the editable drop-down list. Destination yes Enter or browse to the destination. Set the destination as the build folder to store the WAR file within the project. Alternatively, deploy the project directly to the deploy directory of the target server profile. Optimize for a specific server runtime no Select this box to optimize the WAR file for deployment to the targeted runtime. The list of available runtimes will be those configured during the project set-up or by selecting File → New → Server. Copy the file to the deploy directory of the required target server profile, such as the all profile. Note that the WAR file destination may have already been set as the deploy directory in Step 2. JBoss Tools provides a view to test web services. The Web Services Test View can be displayed by following the steps in Web Services Test View. The Show View dialog displays. Click on the Web Services Tester label by expanding the JBoss Tools Web Services node and click OK. The Web Services test view displays. Editable dropdown list Enter the location of the WSDL file or HTTP address of the service to be tested. The combo box requires the path to the WSDL in a URI format. Combo box Select the type of service to test. The options are JAX-WS or any other option to test a JAX-RS service using HTTP request methods (PUT, GET, POST, DELETE or OPTIONS). Toolbar button - Get From WSDL Click this button to display the Select WSDL dialog. Enter the URL, File system location or Eclipse Workspace location of the WSDL file. Given a valid file, the dialog will allow selection of the Port and Operation to test. Once selected, the request details will be displayed in the Request Details panel. Toolbar button - Invoke Once the WSDL file has been selected, the service can be invoked by clicking this button. Response details will be displayed in the Response Details panel. Prompt for Basic Authentication Select this check box to send a username and password with the request. Entering the user details for each subsequent request is not necessary as the details are stored in memory. Headers Enter (Add) one or more name=value pairs. These headers will be passed with the invocation request at the HTTP level where possible. Parameters As for header information, enter one or more name=value pairs by clicking the Add button. Body Enter the JAX-WS SOAP request messages or input for JAX-RS service invocations in this text box. Response headers The headers returned by the service invocation will be displayed in this panel. Response body The JAX-WS and JAX-RS response bodies will be displayed in this box. The raw text returned from the web service invocation can be displayed by clicking the Show Raw button. The output will be embedded in a html browser by clicking the Show in Browser button. The output can alternatively be displayed in the Eclipse editor as xml or raw text (depending on the response content type) by clicking the Show in Editor button. Body Enter JAX-WS SOAP request messages and input for JAX-RS service invocations in this text box. The following sections describe testing JAX-RS web services, including the necessary preliminary steps. The following procedure describes the steps to perform before testing a web service. The Web Service Test View displays. A web service has been deployed to the deploy directory of the chosen server profile. Testing a RESTful ( JAX-RS ) web service is achieved by following a similar procedure to testing a JAX-WS web service. 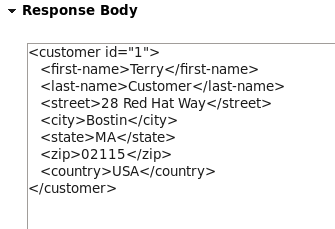 Instead of selecting the JAX-WS option in the combobox, the JAX-RS service is invoked by sending HTTP method requests of the form OPTIONS, GET, POST, PUT and DELETE. As there is no WSDL file associated with a JAX-RS service, the available options can be determined by selecting OPTIONS in the combobox. Selecting the OPTIONS combobox option. Entering the url of the JAX-RS web service. The test procedure is discussed in the following sections for both the RestfulSample and the RESTEasy sample projects developed earlier. Select OPTIONS from the available combobox options. Enter the url of the web service in the editable drop-down list: http://localhost:8080/RestfulSample/MyRESTApplication. The Response Headers text area indicates that the allowed options are [GET, OPTIONS, HEAD] as shown in Figure 4.3, “JAX-RS Response Header Text”. Having established that the GET request is valid, select GET from the available combobox options. The Response Body text area displays the expected “Hello World” text as shown in Figure 4.4, “JAX-RS Response Body Text”. Following the preliminary steps described in Testing a web service, select the OPTIONS method from the operations text area. Enter the url of the web service in the editable drop-down list http://localhost:8080/simple/rest-services/customers. The Response Headers text area indicates that the allowed options are [POST, OPTIONS] as shown in Figure 4.5, “JAX-RS RESTEasy project Body Text”. Select POST method in the the operations drop-down list. We will post xml data to this particular web service. Complete the header details by entering content-type=application/xml in the text area and click Add to add it to the Headers list. The content-type is added to the Headers list as shown in Figure 4.6, “content-type header”. Enter the customer details in the Body Text area as displayed in Figure 4.7, “Customer data”. 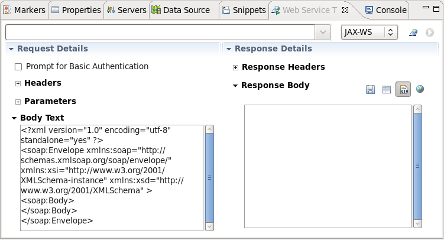 The Response Headers area indicated that a record was created and lists the location as http://localhost:8080/simple/rest-services/customers/1 as shown in Figure 4.8, “Customer added”. Select the GET method in the the operations drop-down list. The Response Headers area indicates a [HTTP/1.1 200 OK] response and the customer data is retrieved and displayed in the Response Body area as shown in Figure 4.9, “GET response”. Editing a record is achieved by using the PUT method. Select the PUT method in the operations drop-down list. 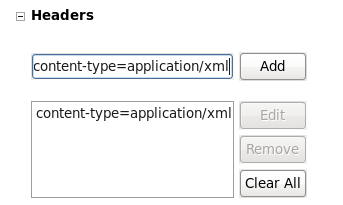 Ensure that the content-type=application/xml header is in the Headers list. The Response Headers area indicates a No Response ([HTTP/1.1 204 No Content]) Figure 4.11, “Response header following PUT”. In this instance, the console does not indicate an update was performed, however, the console may provide useful information following an operation. Perform a GET operation by following the steps in Step 3. The Response Body area displays the updated data. Deleting a record is a similar process to posting. Select the DELETE method in the operations drop-down list. The Response Headers area indicates a No Response ([HTTP/1.1 204 No Content]) as was the case for the PUT operation in Figure 4.11, “Response header following PUT”. Once again, the console does not indicate an update was performed, however, the console may provide useful information following an operation. The Response Body area returns an error report indicating that The requested resource () is not available and the Response Headers area returns a [HTTP/1.1 404 Not Found]. The response header and body messages indicate that the data was successfully deleted. JAX-RS validation is enabled by default. Validation allows your project to be checked for errors. If an error is discovered a Problems tab will appear in the bottom section of your workbench, outlining the errors found. 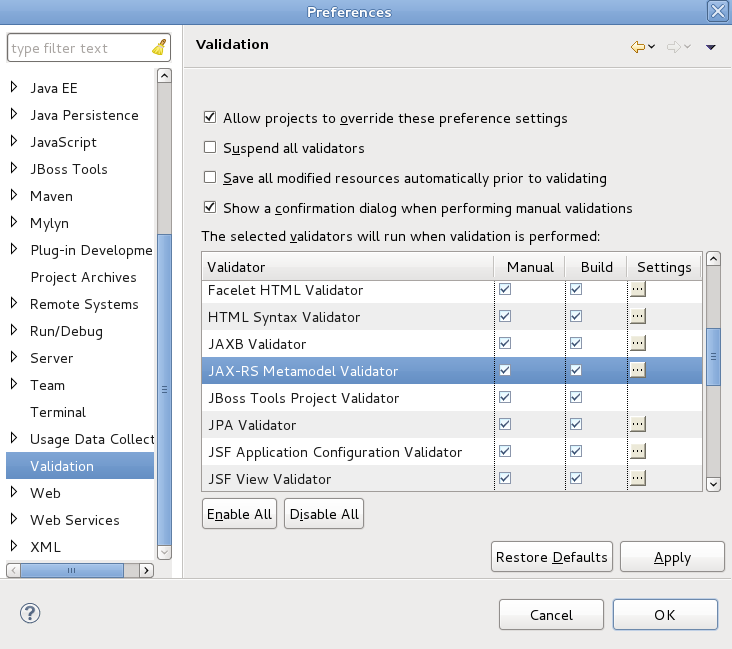 If you wish to turn off JAX-RS Validation, you can do so by first navigating to Window → Preferences → Validation. In the Validator section of the dialog, deselect the checkboxes for JAX-RS Metamodel Validator and click the Apply button, followed by OK.